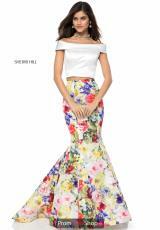 Make a lasting impression on prom night when wearing this ultra chic Sherri Hill two piece style 52005. Showcased is a fitted, ivory crop top with a flattering off the shoulder neckline, cap sleeves, and a beautiful keyhole back cut out. The mermaid silhouette is made in a colorful floral printed fabric for a vibrant look, and completes the style with a lovely back sweep train.